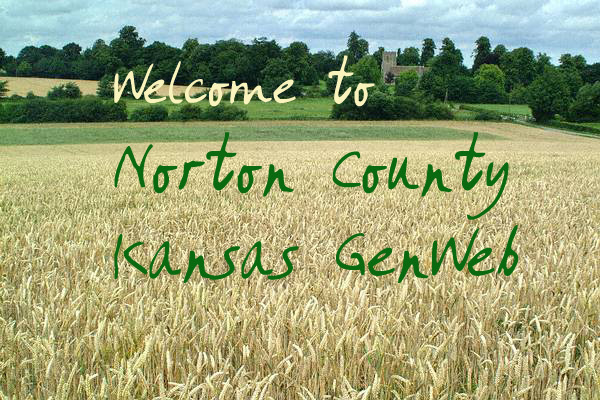 I am a volunteer working to provide access to genealogical and historical information for Norton County. If you have any information to share, would like to transcribe information, or are available to do lookups in the county, please email me. I do not live in the county, and cannot do lookups, except where specifically noted on these pages. Thank you, Ardie Grimes, Norton County KSGenWeb Coordinator. This search engine is provided for your convenience. Please be aware that it is not foolproof. It does not index all pages, and may not find all instances of your desired search, due to human error, transcription errors, or alternate spellings. I'd like to thank Lea Shelley, former host, for her work and contribution to these pages. KSGenWeb logo were designed and are copyrighted by Tom & Carolyn Ward for the limited use of the KSGenWeb Project. Permission is granted for use only on an official KSGenWeb page.